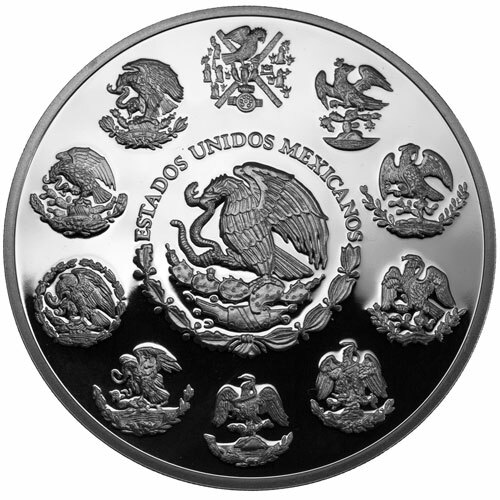 The Mexican Mint issues the Silver Mexican Libertad coinage annually in bullion and proof options. The proof coins in the collection are more unique than their bullion counterparts due to a stunning visual finish and much lower mintage figures than the bullion coins. Today, 2018 1 oz Proof Silver Mexican Libertad Coins are available to you online at Silver.com. 36th issue of the Proof Silver Mexican Libertad! On the reverse face of the coin is the figure of Winged Victory. The obverse side of the coins features the Mexican coat of arms. Silver Libertad coinage from the Mexican Mint debuted in 1982 with a 1 oz silver bullion coin and in 1983 with a 1 oz Proof Silver Libertad. While the bullion coins remained in production going forward, the proof coins were not released in 1984 or 1985 and returned in the 1 oz weight in 1986. Overall, Proof Silver Mexican Libertad coins across all seven weights have been issued continuously since 1996. The 1 oz coin was the only option from 1986 to 1991. Four fractional weights were issued in 1992 and joined by a 2 oz and 5 oz coin in 1996. All of the 2018 1 oz Proof Silver Mexican Libertad Coins in this product listing are available to you inside of protective capsules. The proof version of the Silver Libertad coin includes a frosted design element overlaying a background field that is mirrored and clear. On the obverse of the 2018 1 oz Proof Silver Mexican Libertad is the depiction of the nation’s official seal. The coat of arms for Mexico depicts an eagle as it rests on the branch of a cactus and does battle with a snake. Using its beak and talons it controls the snake as it fights to subdue the serpent. The 1 oz, 2 oz, and 5 oz silver coins in the Proof Libertad collection have this modern coat of arms surrounded by 10 historic versions. 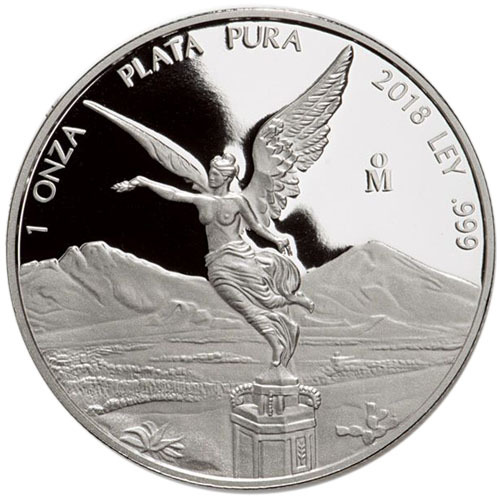 The reverse of the 2018 Proof Silver Libertad Coins features Winged Victory. Her figure stands tall atop the Mexican Independence Victory Column in Mexico City and was erected there on the 100th anniversary of the nation’s victory in its revolution against Spain. Winged Victory clutches the broken chains of servitude in one hand and the laurel wreath crown of independent governance. Please feel free to reach out to Silver.com if you have questions. You can contact our customer service team on the phone at 888-989-7223, chat with us live online, or simply send us an email.